Dr. Harry C. Rowsell was a Canadian veterinarian, pathologist, animal welfare advocate, and humanist recognized worldwide for his outstanding contributions to the humane treatment of experimental animals in both Canada and abroad. Dr. Rowsell received a Doctor of Veterinary Medicine from the Ontario Veterinary College (OVC) in 1949, a Diploma in Veterinary Public Health from the University of Toronto in 1950, and a PhD from the University of Minnesota in 1956. 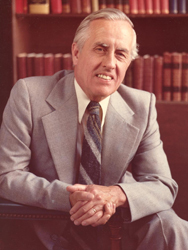 He began his academic career in 1953 teaching as an assistant professor at the OVC, and eventually went on to become the Head of the Pathological Physiology Department. It was here that, in 1964, he established the first animal care policy for animals used in research and teaching in a Canadian institution. He then took on the role of Head of the Department of Veterinarian Pathology at the University of Saskatchewan from 1965 to 1968, followed by a professorship at the University of Ottawa in the Department of Pathology from 1970 to 1986. While at the University of Saskatchewan, Dr. Rowsell was commissioned by the Association of Universities and Colleges Canada to lead a feasibility study concerning the establishment of an advisory body to ensure the uniform application of the guiding principles detailed in the 1966 National Research Council Report of the Special Committee on the Care of Experimental Animals at the national level, and to assist local animal care committees in the effective implementation of these principles. When the Canadian Council on Animal Care was created in 1968 according to his recommendations, Dr. Rowsell was appointed as its first executive director. Under his leadership, the CCAC flourished from the idea that Canadians should take responsibility for the ethical treatment of animals in Canadian science, becoming a cornerstone of quality assurance for ethical animal-based research in Canada. He continued to champion the CCAC until his retirement in 1992, after 24 years of service. His exemplary contributions were formally recognized in 2001 when he was awarded the CCAC's first Outstanding Service Award, which was later renamed in his honour when he passed away in 2006. He was also made an Officer of the Order of Canada, the first veterinarian inducted, for his immeasurable contributions to the establishment of ethically-based animal research, spearheaded by the CCAC. Thanks to his pioneering work, the CCAC continues to work collaboratively with its stakeholders to develop ethical practices and policies that ensure the humane treatment of animals in Canadian science.